On Wednesday, the Tri-City Herald reported that Franklin County, Washington is being sued for allegedly ‘inhumane and barbaric practices’ that have put mentally ill inmates in harms way. Some inmates have been destructive while in custody and others have tried to hurt themselves, he said. Jail staff take necessary precautions to make sure the facility is not damaged and inmates stay safe. It appears that the jail is more concerned with destruction of their property and control over their inmates than making sure they are getting the treatment they need. From the reports provided by the Herald, it appears staff simply feel this kind of abuse and neglect is ‘part of jail life.’ Clearly the jail does not know what to do with them if it is chaining them to fences and more concerned about the wellbeing of his staff and his shiny, renovated jail than the mentally ill people he is holding at his prison. The lawsuit seems to agree, noting that “jail staff regularly use the restraint chair against inmates with mental illness without providing proper mental health care or keeping them in a more appropriate setting.” One female inmate who reported suicidal and claustrophobic feelings was met with 5 days chained to a fence in a suicide smock before jail officials called for a mental health professional. It does not appear that this jail is in a position to care for the mental health needs of its population. Which brings me to a troubling recurring theme in the treatment of mentally ill prisoners: the pervasive use of restraint chairs. 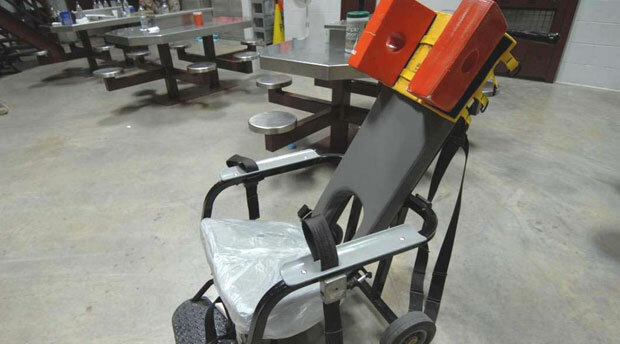 Inmates are routinely confined to these chairs even when they don’t pose a threat to others or themselves, and are often left alone for long periods of times or abused further after the fact. But Franklin County is sadly not alone in its use of restraint chairs and its abuse of prisoners. In South Carolina, two inmates died in a restraint chair — one of whom had been repeatedly punched in the stomach by prison officials and banged his head on the cell wall and door. They were both “profoundly mentally ill.” The South Carolina state Law Enforcement Division denied FOI requests made by the local NBC affiliate for the jailhouse video of his murder. There’s really nothing more to say about this other than its an extreme failure of our justice system that these individuals are locked up and denied the treatment and dignity that is their human right.